New England has been jostled by at least 10 small earthquakes this month: seven in Maine, one off the Maine coast, one in New Hampshire, and one in Massachusetts, said John E. Ebel, a professor and senior research scientist at Boston College’s Weston Observatory. Ebel said there might have also been an 11th quake, in New Hampshire, but it might have just been construction. When earthquakes have a low magnitude, it can be hard to tell them apart from construction disturbances because the waveforms are similar, he said. 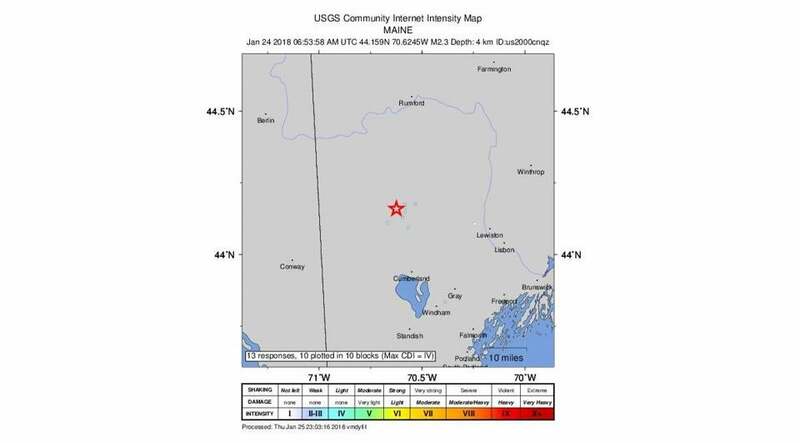 A 2.6-magnitude earthquake that hit coastal Maine on Jan. 17 rattled hundreds, who reported feeling tremors and shaking to the US Geological Survey. Others have been so small that they’ve barely been felt. A quake Wednesday in Harrison, Maine, was nearly unnoticeable. Dispatchers for the Harrison Volunteer Fire Department and Cumberland County Sheriff’s Office said they were not aware of the earth shaking and had not received any reports from residents who felt it. The USGS’s online earthquake reporting site fielded 12 reports from people saying they felt the quake. The Massachusetts earthquake was in Littleton on Jan. 20. A flurry of 10 earthquakes in the region in a short period of time isn’t all that unusual, Ebel said. “When one earthquake occurs in New England, there’s a slightly elevated chance of another earthquake occuring over the next few days in New England,” Ebel said. Overall, he says they’re impossible to predict. “Sometimes it goes on for several weeks,” he said.